A former Audi manager was charged with fraud by the U.S. for his alleged role in helping Volkswagen Group cheat U.S. emissions standards. Giovanni Pamio, 60, conspired to defraud U.S. regulators and consumers through software designed to cheat emissions tests in thousands of Audi vehicles marketed as "clean diesel," the Justice Department said in a news release Thursday. "Pamio and co-conspirators deliberately failed to disclose the software functions, and they knowingly misrepresented that the vehicles complied with" emissions standards, the government said. Pamio is the eighth person charged in the U.S. case against Volkswagen, which has cost the automaker more than $24 billion in government penalties and owner restitution. Audi is a division of VW. An Italian citizen, Pamio worked for Audi’s diesel-engine development department in Neckarsulm, Germany. 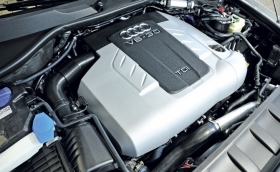 After realizing that it was impossible to calibrate a diesel engine to meet emissions standards within the company’s design constraints, Pamio directed Audi employees to implement software functions to cheat the U.S. emissions tests, the Justice Department said. Audi spokesman Toni Melfi declined to comment and said he couldn’t provide contact information for Pamio. Audi, which is the main profit generator at the larger carmaker, has suffered setbacks in its efforts to emerge from the emissions-cheating scandal. German prosecutors raided the company in March in connection with consumer-fraud investigations related to the case. VW admitted in September 2015 that about 11 million diesel cars worldwide were outfitted with so-called defeat devices, embedded algorithms used to game emissions tests. An agreement with regulators requires VW to compensate owners of 3.0-liter diesel engine vehicles, fix about 58,000 cars and buy back as many as 20,000 Touareg and Audi Q7 SUVs. Pamio, who was identified in a lawsuit as head of Audi's V-6 diesel engine development for the U.S., left the company earlier this year. He was described in a 2008 article in Automotive Design & Production as one of the founding fathers of common-rail diesel design, a fuel injection system developed by Fiat that became the industry standard. In October 2006, Pamio was among several VW executives and managers who met with officials of the California Air Resources Board to discuss emissions standards for future light-duty vehicles, according to a lawsuit filed against VW last year by the state of New York. Pamio was involved in a follow-up meeting with CARB on March 21, 2007, where emission control devices that would be installed on the future vehicles were discussed and VW said the emissions control system would work under "normal vehicle operation," according to company documents cited in the New York lawsuit. While making these assurances to CARB, Pamio and more than a dozen other VW executives and managers were secretly developing defeat devices, according to New York's complaint. Oliver Schmidt, who was VW's liaison with U.S. regulators, in February pleaded not guilty to charges of fraud and conspiracy in the case. He is in custody in the U.S. since his arrest in January while on vacation in Florida. James Liang pleaded guilty in September to conspiring to defraud regulators and is cooperating with the investigation. He is free on bond while awaiting sentencing. The others are in Germany, where they are protected from extradition.